The Exodus was the pride and joy of Bowman Enterprises, who began the project as a joint charity venture and PR stunt. She was the first ship to ever take human beings beyond the boundaries of the solar system. 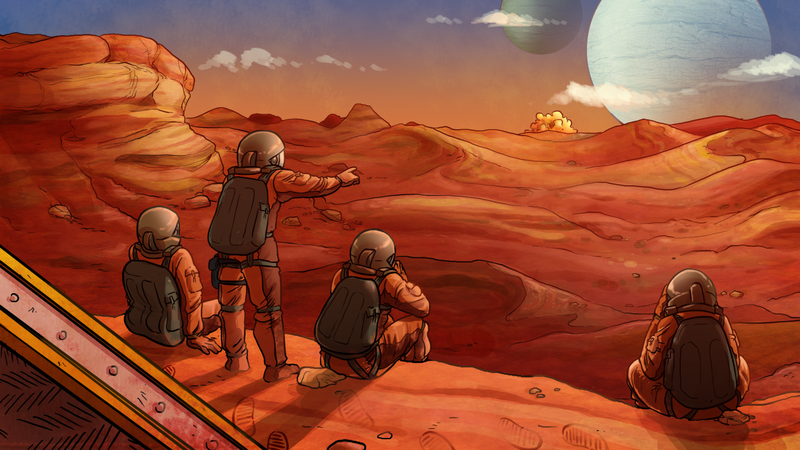 Now her wreckage lies scattered across a barren orange rock in the middle of nowhere, light-years from Earth with no support or hope of rescue, and — as one of the two members of the command crew still breathing — you are left to pick up the pieces. You have barely half the people you set out with. Limited food and supplies. The world is hostile, the air unbreathable, and the only living creatures anywhere are the unfortunate 758 souls under your command. It’s up to you and your ragged team of unusual characters to make sure at least some of them stay alive. This nameless planet is waiting for someone to make their stamp on it. Can you survive there, or will you die in the red sands with everyone else? Can you conquer it and make the next world your home?